Drizzly morning. Perfect weather for getting sweaty. My forearms were on fire. And my legs. And my hands. Before we began, I positioned myself next to the Terminator. He smokes me every time, leaving me choking in his dust, but that’s exactly the motivation I need to fuel my workouts. To my surprise, I somehow managed to stay slightly ahead of the Terminator throughout most of the WOD this morning. But he’s a machine, and with less than two minutes left on the clock, he steadily closed the gap until he pulled in front. In the final few seconds, I caught up to the Terminator -- barely. We tied, each having completed 6 rounds + 24 reps.
On days like this, the benefits of working out alongside other CrossFit crazies are clear. 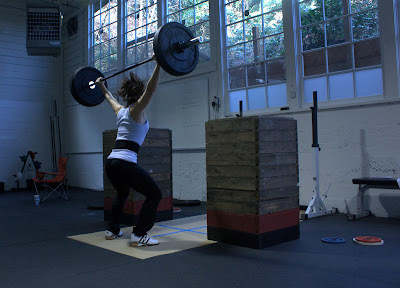 There’s no way I would have pushed myself this hard if I’d done this WOD alone in my garage.